"I think he's trying to get into your slacks!" Nobody is ever going to make a movie or write a novel celebrating the glories of the postwar suburbs. (And having grown up in them, I'm not suggesting that anybody should.) In many respects The Ice Storm is the perfect distillation of the kind of suburban ennui and lives of quiet desperation that we've seen from other keen observers of the bridge-and-tunnel crowd—it's based on a novel by Rick Moody, who's obviously treading on the territory of John Updike and John Cheever, and it's squarely in the line of movies set in the same stratum, like Ordinary People. (Something about this was clearly in the air in the late 1990s, as there are many obvious tonal similarities between this movie and American Beauty.) It's certainly a beautifully made movie, but there's no denying that it's an extraordinarily dispiriting one, whatever the socioeconomic makeup of your home town. The film takes place over just a couple of days around Thanksgiving 1973, in New Canaan, Connecticut—director Ang Lee and his design team are keenly aware that the town is the home of Philip Johnson's iconic glass house, and Johnson's relentless clarity (or exhibitionism, if you like) informs all of the movie. The story looks principally at two families—Ben Hood (Kevin Kline) is living the picture of suburban bliss, with his lovely and devoted wife (Joan Allen), son Paul on his way home from prep school and daughter Wendy still safely in the nest, but that doesn't prevent Ben from coveting and sleeping with his neighbor's wife, played by Sigourney Weaver in full-boat cougar mode. The film splits its attentions pretty evenly between the generations, and much of the sadness of the movie comes from seeing that the parents are as clumsy, obtuse and emotionally retarded as their adolescent children. The teens are played by a veritable who's who of Young Hollywood circa 1997—Christina Ricci is just beyond the Wednesday years as Wendy, and there's a particular kick in seeing Tobey Maguire as her older brother, engrossed in Marvel Comics, still some years away from his Peter Parker period. Elijah Wood and Adam Hann-Byrd are a troublesome pair of brothers (and Weaver's sons), and the object of Maguire's schoolboy lust is a young, remarkably unself-conscious Katie Holmes. There's undoubtedly something profoundly devastating about the movie's climactic third act, but it sort of feels like that by the time we get there, we've been so drained of energy, we've spent so much time in a landscape that's so relentlessly sterile, that we've lost our ability to connect to the emotions of the piece. It's clearly what Lee and company were going for—it's almost like they've turned us into one more anxious, self-loathing sort at the key party—which makes it a very effective piece of filmmaking, but a challenging one to love. Image Transfer Review: As you might expect, the combination of a recently produced film with the care typical of a Criterion release makes for a mighty impressive transfer. Frederick Elmes' cinematography is carefully rendered, with deep dark blacks and careful gradations in a color scheme that's frequently bleached of any saturation. Audio Transfer Review: No quarrels with the audio, either, as Mychael Danna's frequently funereal score balances with the terse dialogue without upending it; it does sound like a fair amount of looping was necessary, though, and that's always hard to mask on a DVD. Extras Review: Given Criterion's necessarily finite output, the only real question this set begs is whether or not the label's resources were well utilized by focusing on a relatively recent and high-profile film, particularly one that's already been released on DVD. We've all got our wish lists of titles we hope Criterion can get to some day, and I won't bore you with mine; this is a great set, but the only real fear is that the opportunity cost of it might be a little too high. Anyway, Lee is joined by producer/screenwriter James Schamus on an excellent commentary track—in a funny way they're both candid and guarded about the film, happy to talk about the travails of production but, as their careers continue to flourish, reluctant to name names or step on anyone's toes. (We hear, for example, allusions to another actor under consideration for Kline's role, but we never get his name.) They thread the needle pretty well with this, and it's a great listen in both independent filmmaking and caginess. The first disc also includes a tone-deaf original trailer, which hawks the movie almost as a wacky family comedy in which everyone will learn a li'l something about life. Disc Two is chock a block with newly produced suburban ennui goodness, in which those on both sides of the camera reflect on the film a decade after its production. Weathering the Storm (36m:08s) offers interview footage with all the principal cast members (Allen, Kline, Maguire, Ricci, Weaver and Wood)—there's a little bit of dramarama chatter, but they're all full of poignant and specific memories, particularly about how they responded to the script on first reading it, and on the emotional sensitivity of their director. Novelist Rick Moody (21m:20s) discusses the uncanny quality of watching his book come to the screen, which he describes as waking from a dream and then stepping into it as it comes to life. Pegged to the theatrical release of Lust, Caution comes a November 2007 discussion, at the Museum of the Moving Image in New York, with Lee and Schamus, principally a celebration of their collaboration, and covering all of their pictures together, including Brokeback Mountain and Crouching Tiger, Hidden Dragon. 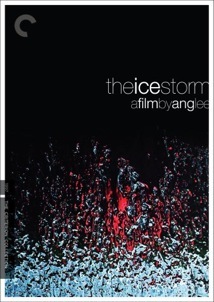 Clustered together under the menu heading The Look of The Ice Storm are three audio interviews with principal members of the creative team, which play over stills, silent clips and preparatory sketches from the production. Cinematographer Frederick Elmes (13m:35s) discusses his rapport with Lee, and their being influenced by the photorealism that was prevalent at the time of the story; production designer Mark Friedberg (14m:00s), who blithely took on the daunting challenge of producing the meteorological event of the movie's title; and costumer designer Carol Oditz (8m:23s), on the perils of 1970s fashion, and her firmness that the look "couldn't be Brady Bunchy." Great insights from some of those involved in moviemaking who simply don't get enough credit. Four deleted scenes (6m:46s altogether) are a little jokier than the tone of the feature; Schamus provides commentary for them as well, principally about why they were cut. And the accompanying booklet features lots of swell snapshots, and an appreciation of the film and Lee by Bill Krohn. A carefully rendered portrait of an emotionally dispiriting time and place, The Ice Storm simply can't be written off as a look at something long ago and far away. It's as much of a period piece as the director's previous picture, Sense and Sensibility, and just as attuned to the emotional gradations of its button-downed times as was Miss Austen. The full-boat Criterion treatment shows the movie off to great advantage.